I need some help with optimizing my protection paladin, for some reason i'm getting a lot of spiky damage especially at encounters like Jugger/Nazgrim while i still have SotR up. So i was wondering if you guys could take a look at my logs, and maybe point me at some things that i can improve. Besides that i got some troubles holding threat against my OT, even with using Hand of Salvation my OT seems to overtake me quickly ( For the record he's a druid ). Any idea on how to change this or to improve? Sorry for the wait, I've been fairly busy today. I will likely be unable to help you until thursday, but I might take a break during my work load tomorrow to break it down. As for your problem being threat: I can't tell without armory, since worldoflogs is difficult to analyze, but I'm guessing its the fact that druids are amazing at damage and paladins are the worst. Looking at your logs, you don't seem to be taking any avoidable damage, but your SotR uptime is really low. Having inconsistent and low uptimes will cause your healers tons of stress and make them have to bounce around a lot on what they want to heal, even entice raid healers to heal you when they shouldnt. Focus more on keeping yourself with higher uptimes. As a comparison, I have a 54% uptime to your 38% uptime, and we both use the stay-out strat. I recommend Holy Avenger for that reason, since theres a fair amount of time where you're not tanking/doing nothing, Holy Avenger becomes your best talent since it'll be active only when you want it. Nazgrim has the same problem, your 37% to my 58%. I recommend you fix up your rotation to generate more holy power, then use it correctly instead of waste it away by capping. 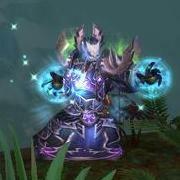 The rotation never really changes from the rotation listed in the Prot Paladin guide on this website, and I recommend you touch up on it, and make sure to maximize your shield usage. Armory link is broken due to Ravencrest servers still being down, i can't check any of my characters on that server right now. Now for Holy Avenger, i will try that talent out and see how it goes. Got another raid tomorrow is it ok to post my logs again? I really recommend getting one of the amp trinkets (even if its a caster one) over that rooks talisman. I use two amps and it's just amazing. The vial is great too though, so dont sub it out on progression, or fights that are CD based. Fouton just wondering what SoO fights you use Holy Avenger on? I can see the benefit of it in fights where there are significant spike phases like Malkorak Blood rage. Yeah normally i use the amp one from Thok, but i don't have it equipped right now due to solo tanking Malkorok 25 man HC needed that trinket for it.